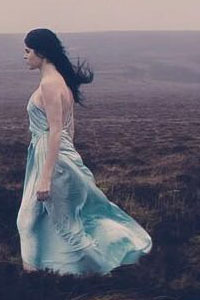 Claire O'Connor was commissioned by Middleton ‘Very rare’ to create a custom made gown, to reflect the brands luxurious characteristics for this commercial. Claire O'Connor (one of 9 designers) selected for The Peroni Moda Awards - seeking to push the boundaries of excellence and style, and discover talented and aspiring designers. 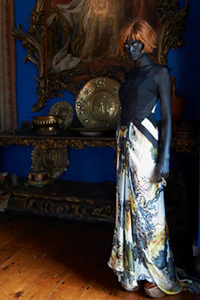 No 10, Dublin's most exclusive venue, was the setting to showcase a selection of Claire O'Connor's one off pieces while collaborating with Ireland's most exciting emerging talent. Claire O'Connor designed a one-off piece for The Dais Project - a trilgoy of films created by Irish stylist Sonya Lennon and Swiss/Irish film-maker Christian Ammann. Claire O'Connor collaborated with New York photographers The Hayes Brothers to create 'Metamorphosis' - a fashion film based upon life and death. 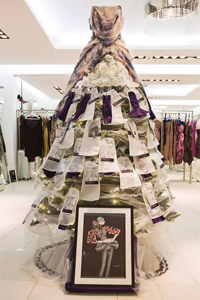 Claire O'Connor unveiled a Christmas Tree dedicated to the late Alexander McQueen, unveiling a daily quote from various luminaries of the fashion world to create an advent calendar. Claire O’Connor was commissioned to design and make a dress for Niamh Kavanagh and her backing singers for the Eurovision song contest final which was held in Oslo.